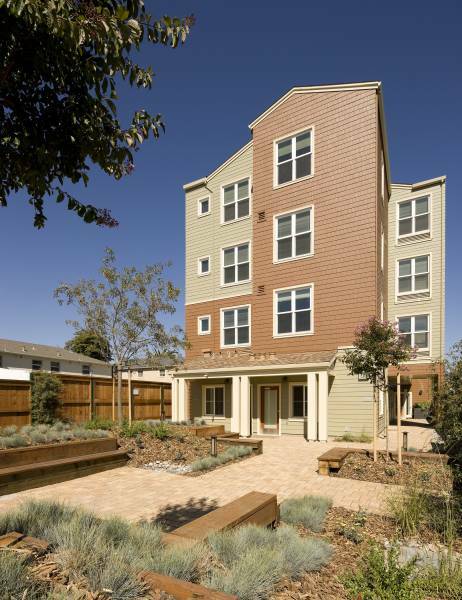 East Bay Housing Organizations | What is Affordable Housing? Residents of Main Street Village, a community in Fremont developed and managed by MidPen Housing and Abode Services. Most people call housing “affordable” when they don’t have to choose between paying rent and buying groceries, when they don’t have to live in crowded or unhealthy conditions, and when they can afford a home that provides a sense of security and community. EBHO’s definition of “affordable housing” includes homes that are sustainable, beautifully designed, professionally managed, and connected to services and amenities—places that create dignity and opportunity for working families, seniors, and those with disabilities or special needs. Communities thrive when people have safe and stable housing; when they live near their jobs, schools, and places of worship; when families can build roots and meet diverse neighbors; and when we use resources wisely, greening our housing and preserving open space. But our ongoing shortage of affordable housing threatens this vision. Demand for rental housing is increasing throughout the Bay Area, which has an estimated shortfall of 200,000 apartments and homes affordable to low-income families.1 The recession has further strained an already broken housing market: unemployment makes it harder for families to make rent, foreclosures continue, and governments have slashed homeless and housing assistance. This Guidebook provides a snapshot of our current landscape. The picture isn’t rosy, but it demonstrates how housing advocates, environmentalists, employers, unions, faith leaders, working families, people with disabilities and many others are building a movement to reinvest in our communities. High and rising rents. As people displaced by foreclosure seek rental housing, the East Bay’s notoriously high rents continue to rise. A minimum-wage earner would have to work about 135 hours a week to afford a “fair market rent” two-bedroom apartment.2 Lower-income people are forced into substandard housing, doubling or tripling up or moving to outer communities, while the very poorest face homelessness. Shows the spectrum of income levels used to determine qualifications for affordable housing. People at the lower end generally might qualify for supportive or public housing; those in the 50–80% AMI for non-profit rental housing, and those at 100% AMI might be candidates for affordable homeownership. A continuing wave of foreclosures. An estimated 28,000 households have been displaced by foreclosure in Oakland alone.3 Even as banks, governments and advocates struggle to respond, foreclosures continue, disproportionately affecting people of color who often live in the hardest-hit communities. Drastic federal and state budget cuts. Federal HUD funding for housing was cut by over $2.5 billion nationwide. In early 2012, redevelopment agencies in California were eliminated—a turning point in land use and local funding that has been likened to the impact of Proposition 13 (the 1978 measure that limited property taxes). The loss of $1 billion of annual affordable housing funds is forcing a re-evaluation of how affordable housing is incentivized and financed. How many hours would these East Bay residents have to work to afford a one-bedroom apartment? Costa County,and on 2011 wage data from www.labormarketinfo.edd.ca.gov. A rising consciousness that economic equality is crucial to our nation’s future. As the Occupy movement spread west, people from all walks of life spoke out for better jobs, community reinvestment, an end to unjust foreclosures and evictions, and a return to the idea that we share a common future. Using knowledge and experience to find solutions to homelessness. The 2011 Alameda Countywide Homeless Count found that the number of homeless people has declined almost 14% since 2007; in Contra Costa County, the number of homeless people living outside declined by 20%. While significant challenges remain, especially for families with children, service providers and local governments have learned that focusing on housing and integrating services makes a difference even during the recession. Big picture plans. As the government’s role in providing infrastructure and social goods evolves, advocates in all fields are recognizing that housing, transportation, public health, environmental justice and economic development are intertwined. Through the regional Sustainable Communities Strategy and local efforts like the Concord Naval Weapons Station Base Reuse Plan, we are connecting the dots between funding sources and taking a holistic approach to community planning. The challenges are formidable, but we will rise to meet them. We can create a better future, in which everyone’s basic housing needs are met. We will link individual and collective power to build stronger, more equitable communities. Join us. This article appeared in the 2012-2013 Affordable Housing Guidebook. Click here to download the hard copy. 2. National Low Income Housing Coalition. Out of Reach 2012. 3. Ali Winton, “Out of Ammo.” City Limits Vol 35. No. 6. January/February 2012. Click here to learn more about how to make a difference on the issue.